It's official! RES'EAU-WaterNET's second phase is officially out of the gate thanks to a new NSERC Strategic Network Grant, announced on January 9, 2013 by the Honourable Greg Rickford, Minister of State (Science and Technology). 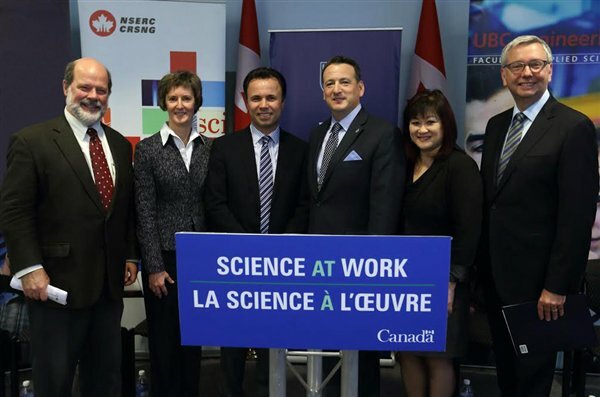 Minister Rickford unveiled over $43 million in support for 77 scientific teams at universities across the country. Researchers will work with companies and other organizations on long-term projects in areas that benefit Canadians and improve their quality of life, such as advancing 3D technology for wireless systems, studying the impact of oil spills on river beds and fish habitats, and developing affordable solutions for clean drinking water in small, rural and First Nations communities. The projects are being funded through two grants, the Strategic Network Grants (through which RES'EAU is funded) and the Strategic Project Grants, administered by NSERC. "We have been working closely with our researchers and collaborators in industry, government and small Canadian communities to prepare for the second phase of the network," said Dr. Madjid Mohseni, scientific director for RES’EAU-WaterNET. "We are grateful that our approach to innovation has been validated through the support of NSERC and the federal government, and we are ready and eager to hit the ground running."